Command Tutorial Pan and zoom in a drawing, and control the order of overlapping objects. Pan and zoom in a drawing, and control the order of overlapping objects. The easiest way to change your view is by using the wheel on your mouse. Zoom in or out by rolling the wheel. Pan a view in any direction by holding the wheel down and then moving your mouse. Zoom to the extents of your model by clicking the wheel twice. Tip: When you zoom in or out, the location of the cursor is important. Think of your cursor as a magnifying glass. 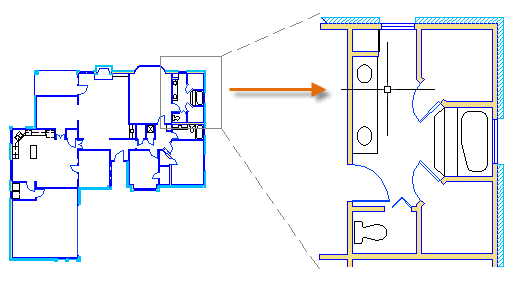 For example, if you position the cursor in the upper-right area of the floor plan as shown below, zooming in magnifies the dressing room without shifting the view. Note: If you cannot zoom or pan any more, type REGEN in the Command window and press Enter. This command regenerates the drawing display and resets the extents available for panning and zooming. If you create objects that overlap each other, you might need to change which objects are displayed on top or in front of the others. For example, if you want the yellow highway to cross the blue river rather than the other way around, use the DRAWORDER command to reorder the objects. 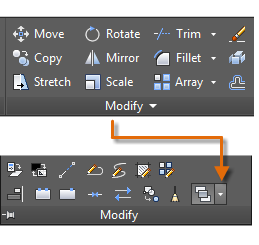 You can access several draw order options from the Modify panel on the ribbon. Click to expand the Modify panel, and then click the down-arrow as shown below. The draw order options that are listed include sending all hatches to the back, all text to the front, and so on.